After getting such a positive response from my How to Pad and Tape a Color Guard Rifle and How to Make Color Guard Swing Flags tutorials I decided to make it a series. 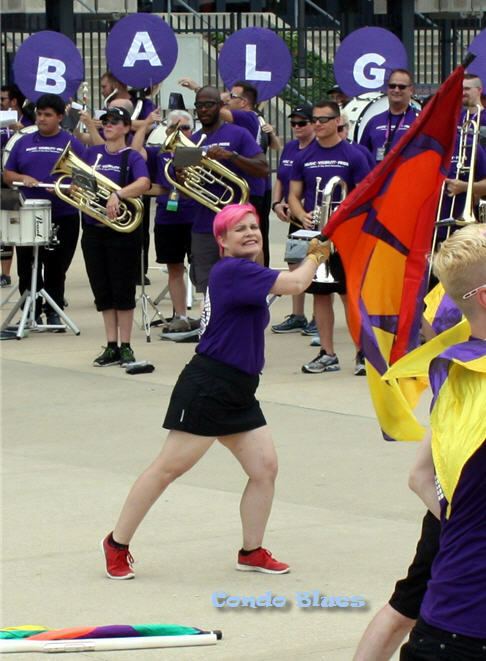 The last piece of equipment in my DIY Color Guard series is also my first love since my newbie flag corps days in middle school – the flag! Do you want to toss a color guard flag so high it touches the sky? You can if add weights to each end of the flag pole. While we are at it, let’s add Cheaters (also called Thirds, or Cheater Tape) to the pole too. Adding Cheaters to the flag pole is an excellent cleaning tool to ensure the guard members’ hands are in the same position. Keep reading and I'll give you some of the pros and cons of using Cheaters with your guard. Update for my photo haters 7/30/2018: I took this photo as a depth of field shot to show the entire flag pole with cheaters for multiple on line formats. I guarantee the measurements and my super easy how to tutorial instructions are correct despite what some very rude, haughty, and downright nasty trolls claim. 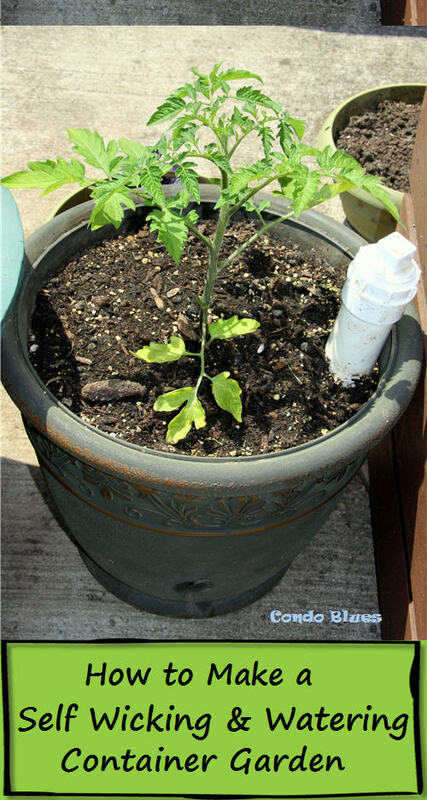 Lead free electrical tape - Standard electrical tape contains lead so it will not conduct electricity but is potential dangerous to handle. 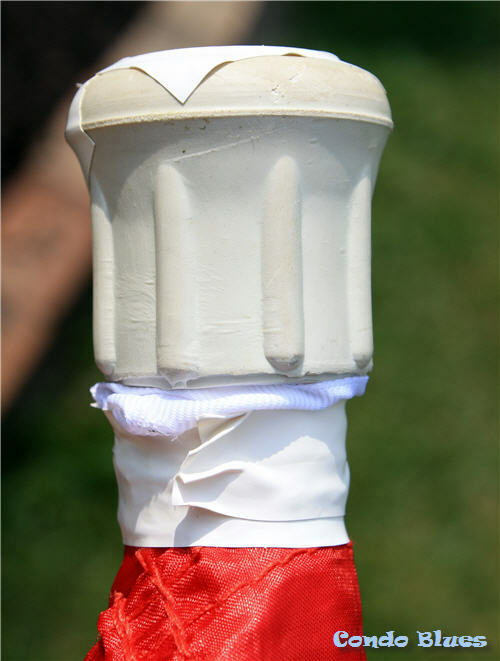 Make elaborately sure you are using lead free electrical tape for the safety of your color guard members! 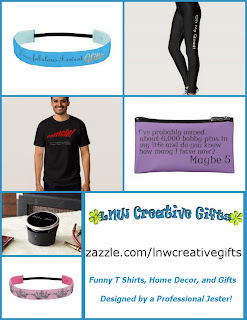 Disclosure: I am including affiliate links in this post for your convenience. Thank you for allowing us to keep bringing you free helpful content via this blog. You are awesomesauce! Most color guard equipment stores sell weights made for color guard flags, although most folks (including myself) do not buy them. Personally I think they are stupid money for a one size might not fit all kind thing that you usually can’t return (unlike the options above). Not to mention, you can't easily change the weight of the pole to fit the type of tosses a new routine requires with ready made flag pole weights but you can if you use carriage bolts..
As long as you remember that the big weight goes on the top and the smaller weight goes on the bottom you are halfway there! 1. 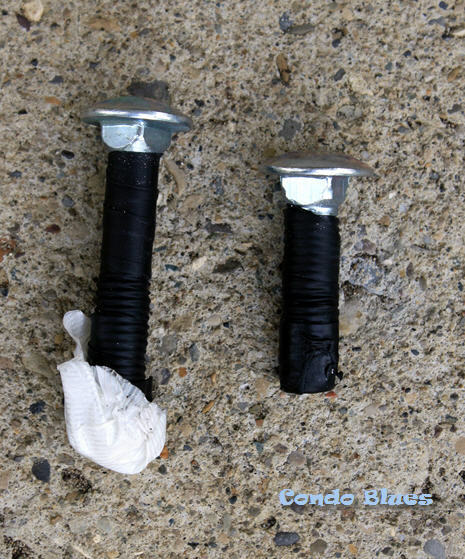 Wrap tape around the end of each carriage bolt to keep it from clanking against the inside of the metal flag pole. You don’t want to distract from the amazing musicians around you a rattling flag pole now do you? BTW the correct answer to the above question is no. 2. It usually easier to slip the flag onto the pole next than trying to put the flag onto the pole over the bulky crutch tips. It’s no big deal either way as long as you eventually put the flag onto the pole right side up! The white ribbon is a weird sleeve loop that came with the color guard practice silk (flag) I bought. 4. Put the large carriage bolt in the top of the flag pole and cap the top the flag pole with a rubber chair legs tip to keep the bolts in place for Step 6. Rubber crutch tips like the ends shown in this post are also competition legal and work just as well as rubber chair leg tips. I've used both for color guard flags. Crutch tips are generally more expensive when you need to buy a bunch because they are only sold in sets of two unlike rubber chair leg tips that are sold in sets of four or more. I'm using crutch tips in this tutorial because I bought one flag for myself as a personal practice flag. When I recently replaced the ends and weighted all of the equipment for my flag corps I bought rubber chair leg tips for budget reasons. 5. To keep the flag from “sailing” (bunching up during a performance) place two pieces of electrical tape side by side over the top of each crutch tip. A dramatic recreation of a flag sailing. Not pictured: The smile masking the frustration of trying to correct a sail while also performing. Guardies you know what I'm saying, right? 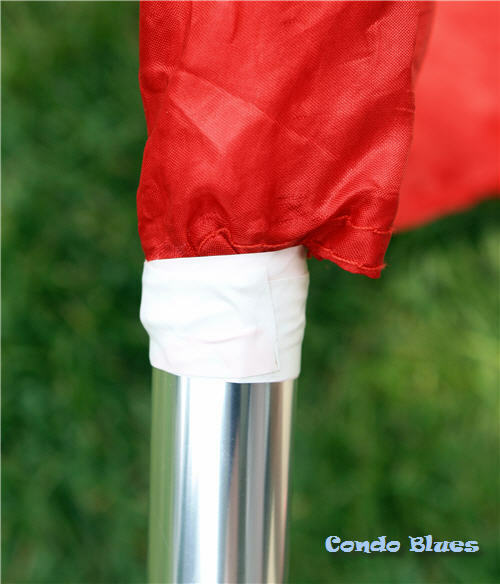 The idea is to create a smooth taped surface so the silk slides off the end of the flag pole instead of bunching up. I like lining up two pieces of lead free electrical tape side by side to create a smooth surface. Some instructors prefer a star type formation of tape. 6. 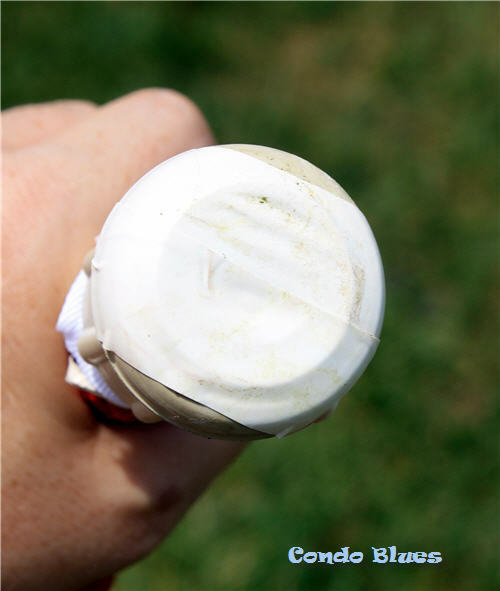 Run 2 to 3 rings around the side of each crutch tip to completely cover the cap and to tape it to the flag pole. A wee little bit of my crutch tip is not covered with tape. This might make it fail a winter guard judge’s inspection but is fine for practice and non competition situations. 7. Tape the flag to the middle-ish part of the pole with a few loops of tape. Ta Da! You just created the Tab. 8. Repeat Step 2 with the small carriage bolt and the bottom of the flag pole. 9. 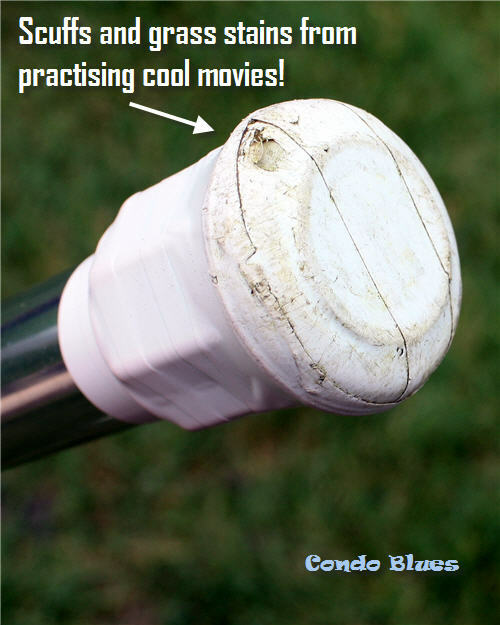 Put a crutch tip on the bottom of the flag pole and tape in place like you did in Steps 4 and 5. I didn't retape this end of the pole for this tutorial. Busted! The super duper cheater tape secret. 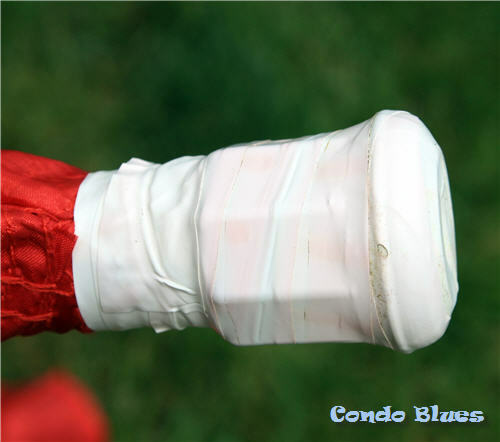 What is color guard flag corps cheater tape (AKA cheaters or thirds)? 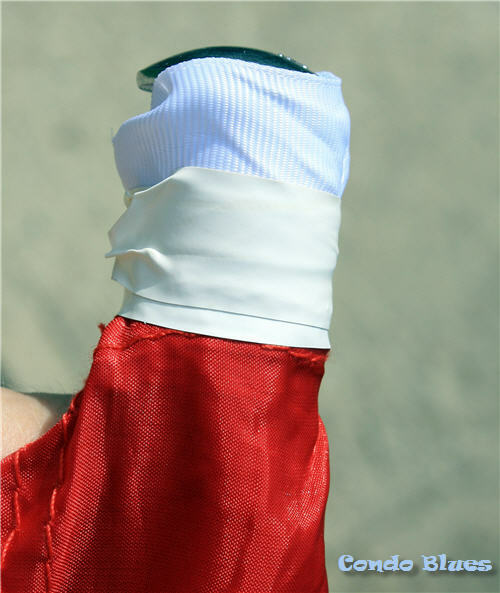 Cheater tapes are circles of tape color on the flag pole guard members use as a guide to keep their hand placement on the pole as uniform as possible. 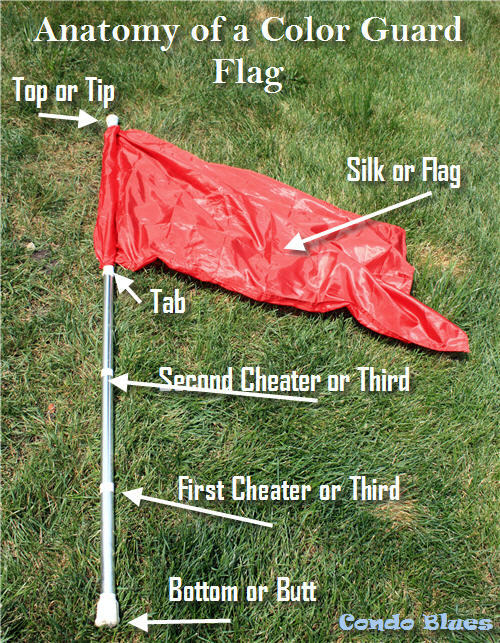 Cheaters can also be used as an instructional short cut when you are teaching or cleaning your super cool moves as in "on Count 5 your left hand should be on the first cheater so everyone tosses their flag at the same height ." Some flag corps tape their flag poles in thirds with color or prism tape so the tape will make a circle design as the flag twirls when doing front spins and the like and less for hand placement or teaching purposes. That's OK too. The only potential downside to using cheaters in a competition situation is it is possible for judges to take points off if the cheaters make it glaringly obvious your group's hand positions are not perfect. 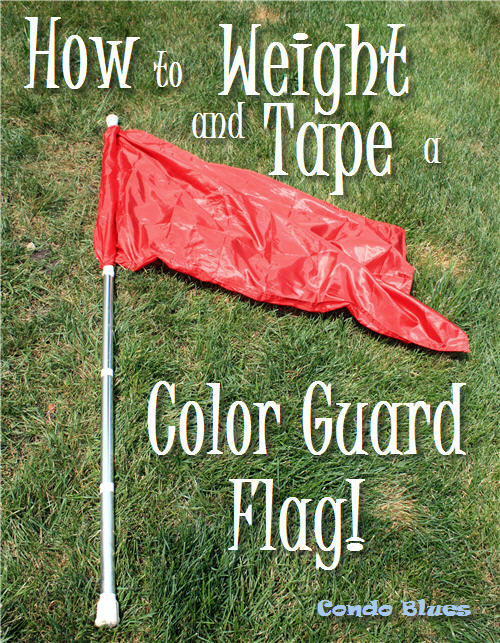 For this reason, many competition guards use clear tape or a color matching their flag poles or mark practice flags and poles and leave performance poles unmarked. 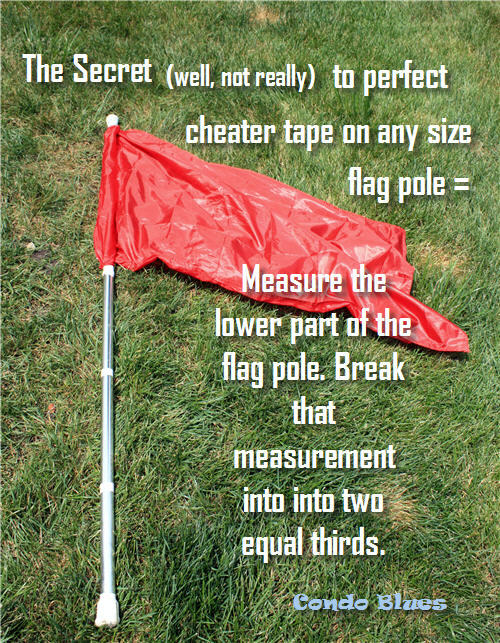 When it comes to putting cheater tape on a flag pole, most color guards, flag corps, and drum corps will break the pole into thirds although some may place cheater tape at different measurements depending up the work they are doing in their show. For the sake of simplicity, I am going to show you how to add thirds of cheater tape since that is somewhat the standard. The only difference between adding thirds to a 6 foot flag pole and a 5 foot flag pole are the measurements. Flag on a flag pole - Many marching band flag corps like to spin 6 foot color guard flag poles and flags like these on the field and/or on the floor for winter color guard competitions. Some guards like mine spin 5 foot or 5 1/2 foot color guard flags and poles like these in parades to lessen the chance of accidentally hitting parade audiences who enthusiastically stand in the street instead of safely on the sidewalk as requested by the event. 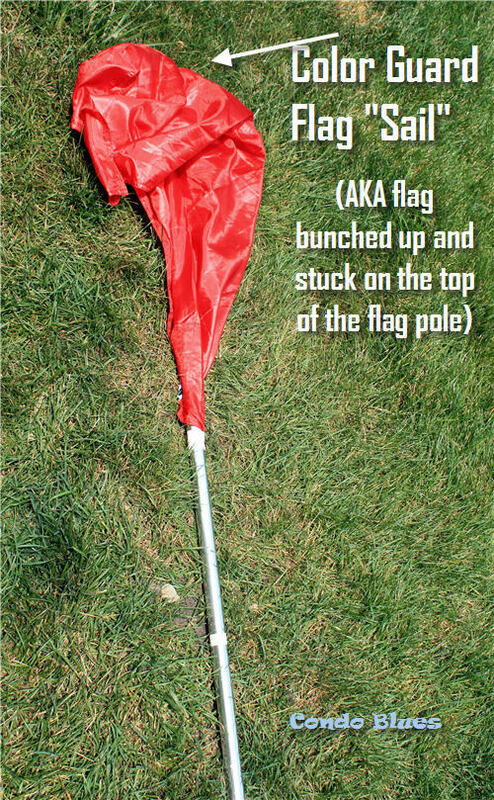 This tutorial will work for any size flag and flag pole your group chooses to spin. 1. Measure the bottom of the flag pole and break it into thirds, marking each with the pencil. A five foot color guard flag pole is 60 inches long. A six foot color guard flag pole is 72 inches long. Five foot pole: 10 inches from the bottom of the flag pole. Six foot pole: 12 inches from the bottom of the flag pole. 4. Go forth and spin! Performance action shot! Whoosh, whoosh and HIT!